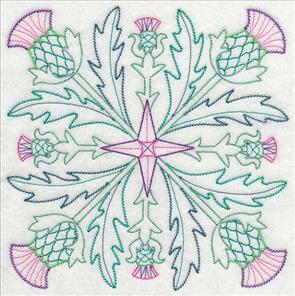 Celtic artwork is an inspiring and beautiful source of ideas for embroidery designs. 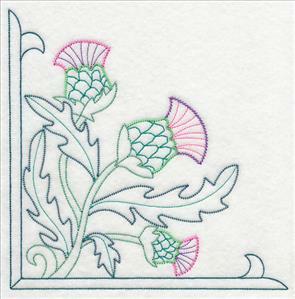 Graceful knotwork can be woven into details; flowers of Ireland and thistles of Scotland are beautiful subjects and focal points. of Celtic artwork. 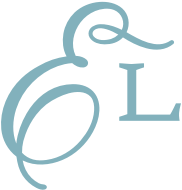 Birds and animals are decorated with lines of knotwork. 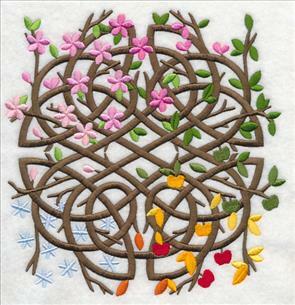 Irish wildflowers will bloom from placemats, quilt borders, and blankets. Scroll down the page to see these beautiful new designs! Click on a link to the size that you need, and add the designs to your basket. Enjoy these beautiful new designs! Wrap yourself in Celtic beauty! The free tutorial for making this wrap is right here. 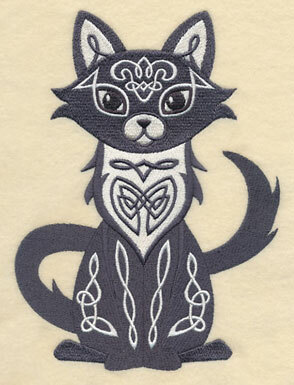 Animals of the forest are embellished with graceful Celtic knotwork. We tucked the elegant lines into surprising places! 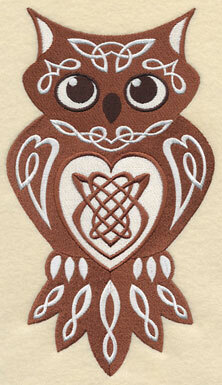 Note the heart-shaped lines on the owl's wings below, and fish-shaped knotwork around the cat's eyes. 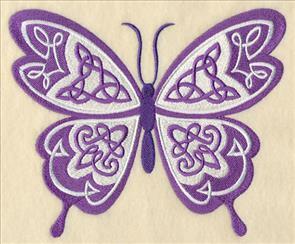 5.86" x 7.82" and 4.85" x 6.47" and 2.89" x 3.85"
A butterfly and swan have graceful knotwork in their wings. Let your creativity take flight with these designs! 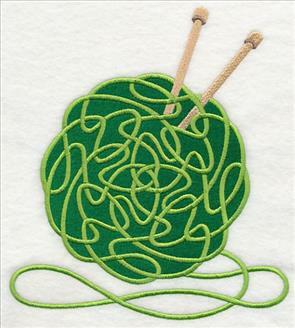 Stitch them onto tote bags, pillows, denim jackets, vests, and more. 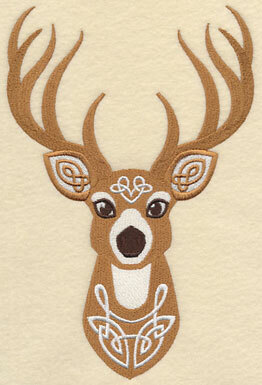 6.54" x 5.87" and 5.39" x 4.84" and 3.87" x 3.48"
A buck has elegant Celtic detail in his ears, on his forehead, and chest. A fox has clever detail on his forehead, chest, and around his eye. 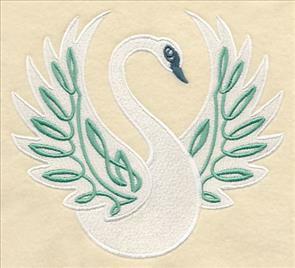 These designs will be dramatic additions to towel sets, tote bags, and wall hangings. 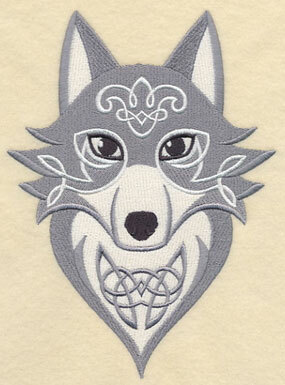 5.67" x 7.81" and 4.85" x 6.68" and 2.81" x 3.86"
A wolf and horse become extraordinary with the addition of Celtic knotwork. Add these designs to fleece blankets, denim jackets and vests, and tote bags. 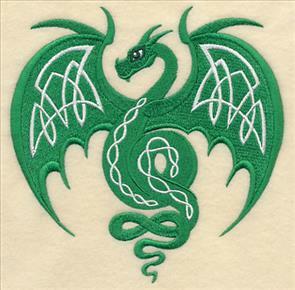 5.86" x 6.06" and 4.85" x 5.01" and 3.73" x 3.86"
A dragon's wings and body are embellished with graceful Celtic strands. And, there's a hint of the art form in his tail, too! 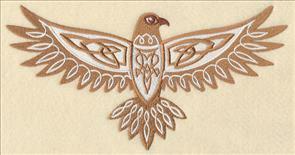 A hawk takes flight with knotwork on his wings and tail-feathers. 9.38" x 4.85" and 6.85" x 3.55" and 3.85" x 2.05"
Choose your favorites by clicking the links above, or buy all 10 birds and animals in a design pack! 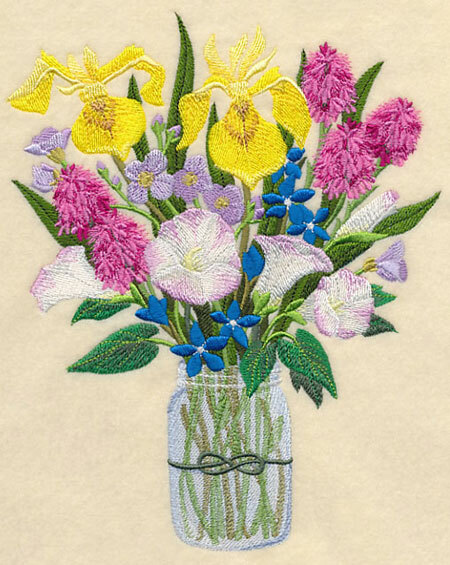 Colorful bouquets in classic canning jars have long been a favorite for embroiderers. 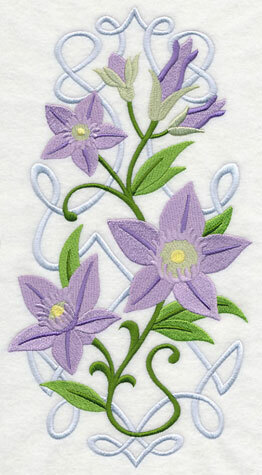 We've created designs of spring crocuses, daisies, spring flowers in a watercolor effect, tulips, and Texas wildflowers. Requests continue to come in for more! Ireland is known for its beautiful wildflowers. A country walk is peppered with these delicate blooms! 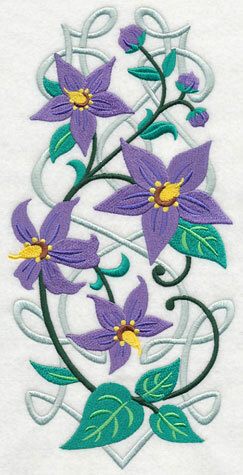 Add sky-high embroidery designs to your projects! Vertical sprays and borders are dramatic additions to the legs of jeans, Capris, and skirts. 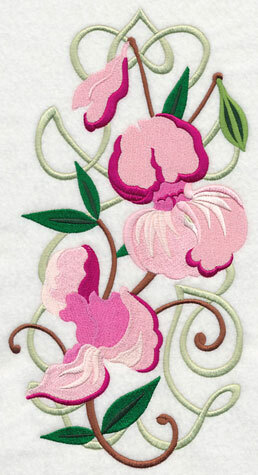 They're also stunning on table runners and placemats. The Autumn Gentian (below, left) and Indian Balsam flowers (below, right) are set against elegant lines, reminiscent of knotwork. 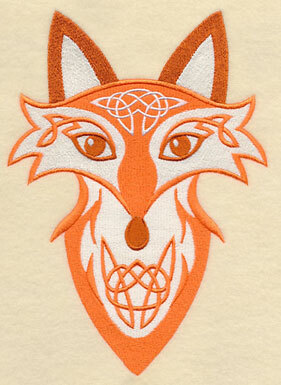 Fox and Cubs (below, left) and Tormentil (below, right) are bright and lively additions to garments and home decor. 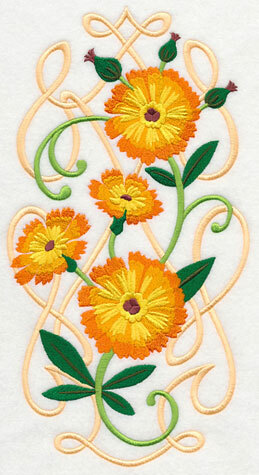 The orange and yellow blossoms will bloom bright from table linens and bath towel sets. Woody Nightshade (below, left) and Hedge Bindweed (below, right) bloom bright and bold. 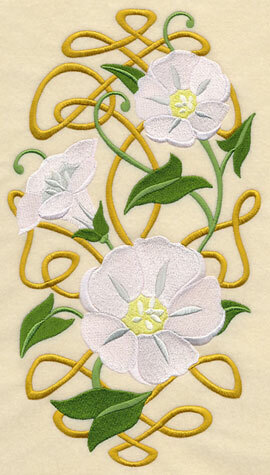 Their stems are interwoven with graceful lines of knotwork. Pick your favorite flowers by using the links above, or get all six in a design pack! The pack is available in four sizes. 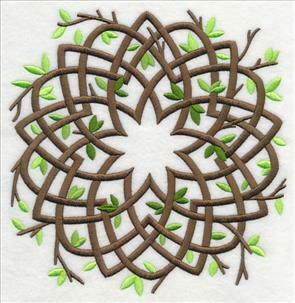 Celtic life was marked by the seasons. Celebrations formed around the changes - autumn to winter, winter to spring. 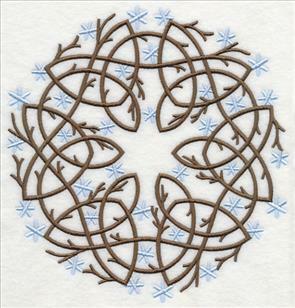 The medallion shown below is composed of Celtic knotwork and delicate elements of each season: snowflakes, flowers, leaves, and apples. 7.72" x 7.78" and 6.87" x 6.92" and 5.86" x 5.90" and 4.86" x 4.90" and 3.86" x 3.89"
We've also created separate medallions for each season. 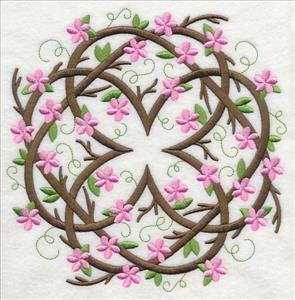 Use the design above as the center of table linens, quilts, and pillows. 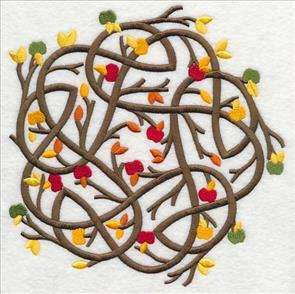 Arrange the other seasons around the medallion for beautiful results! Spring flowers are in the medallion on the left; summer's medallion on the right features lush leaves. 7.75" x 7.78" and 6.88" x 6.89"
5.85" x 5.85" and 4.87" x 4.87"
7.64" x 7.79" and 6.87" x 7.00"
5.87" x 5.98" and 4.87" x 4.96"
Autumn's medallion on the left features colorful leaves and apples. Winter's medallion on the right is peppered with delicate snowflakes. 7.73" x 7.79" and 6.89" x 6.94"
5.87" x 5.91" and 4.89" x 4.93"
7.48" x 7.78" and 6.88" x 7.16"
5.85" x 6.08" and 4.87" x 5.06"
The thistle is the sign of Scotland. The prickly plants are found everywhere in the land! One legend tells us that Norse invaders were approaching a group of Scottish warriors, who were asleep. 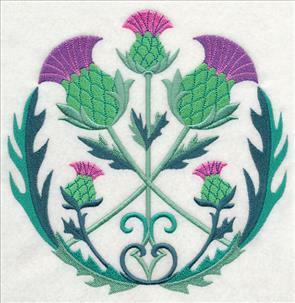 One of the Norsemen stepped on a thistle with his bare feet and cried out loud. The Scots woke and soundly defeated the Norsemen. 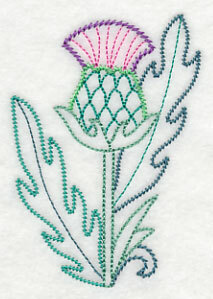 Thistles have beautiful colors - purple puffs, green stems. They've become a popular design motif for home decor, no matter where in the world you live. Add them to table linens for dining, aprons, bath towels, and quilts. 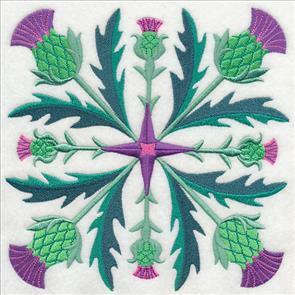 3.29" x 7.80" and 2.91" x 6.90"
2.49" x 5.90" and 2.07" x 4.90"
This border has a trio of thistles. 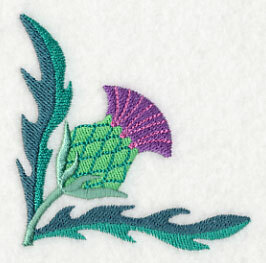 It's a beautiful addition to towel sets, aprons, and placemats. 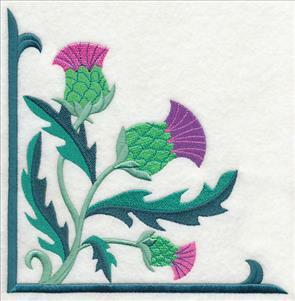 7.80" x 3.29" and 6.90" x 2.91" and 5.90" x 2.49" and 4.90" x 2.07" and 3.90" x 1.65"
Tuck corners of thistles onto pockets and linen napkins! 3.29" x 3.29" and 2.92" x 2.91"
2.49" x 2.49" and 2.07" x 2.07"
The designs can be ordered singly - just click on the links shown above. Or, buy them in a design pack! 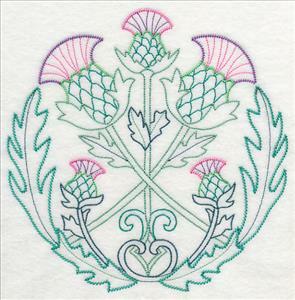 The thistle designs are also available in the popular "vintage" style! 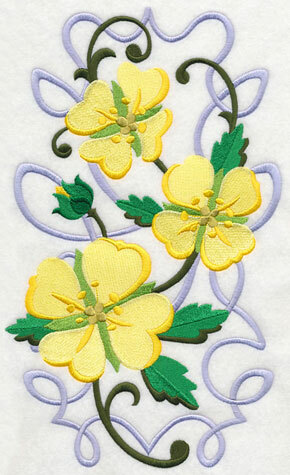 Vintage designs are light and open, with stitches that are reminiscent of hand embroidery. They're beautiful on quilter's cotton, tea towels, and light linen. 5.89" x 5.90" and 4.90" x 4.90"
Spring is on the way, and it's time to freshen up the wardrobe! 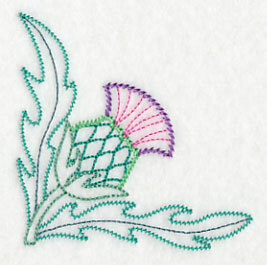 These delicate thistle designs will bloom beautifully on skirts, dresses, and shirts. 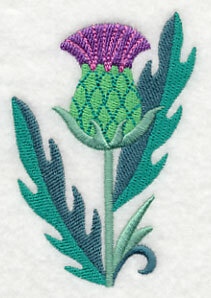 3.33" x 7.80" and 2.95" x 6.90"
2.53" x 5.90" and 2.11" x 4.90"
Add borders of thistles to table runners, placemats, aprons, and tea towels. 7.80" x 3.31" and 6.90" x 2.93" and 5.90" x 2.51" and 4.90" x 2.09" and 3.90" x 1.66"
Tuck corners onto quilts, linen napkins, and pockets of shirts! 3.31" x 3.32" and 2.93" x 2.94"
2.51" x 2.52" and 2.09" x 2.10"
The designs can be ordered singly - just click the links shown above. Or, buy them in a design pack! Along with beautiful wildflowers, Ireland is also known for wool and hand-knitted goods. Sweaters, capes, and scarves are the best way to guard against the damp cold! Below you'll find two designs that celebrate this craft. 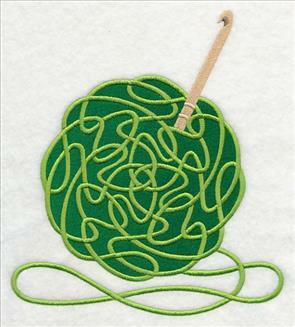 A ball of yarn (complete with knotwork) is paired with knitting needles (left) and a crochet hook (right). 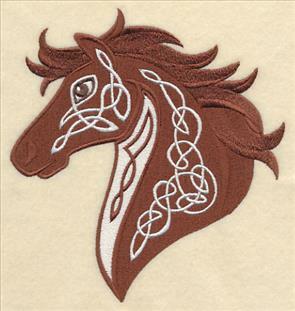 Show your Celtic and Irish pride with these designs! 6.91" x 7.70" and 5.86" x 6.53"
6.89" x 7.68" and 5.84" x 6.51"
4.85" x 5.40" and 3.49" x 3.88"
Little Mister Monkey and Little Miss Monkey are two of the most popular characters at Embroidery Library. Their antics bring smiles from quilts, pajamas, towels, and book bags! 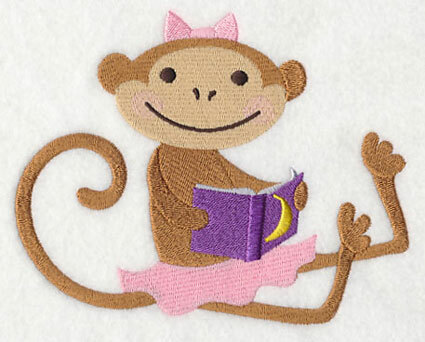 Stephanie requested "Little Miss Monkey" reading, and we were happy to oblige. We even gave her a book about bananas. 5.92" x 4.85" and 3.86" x 3.16"